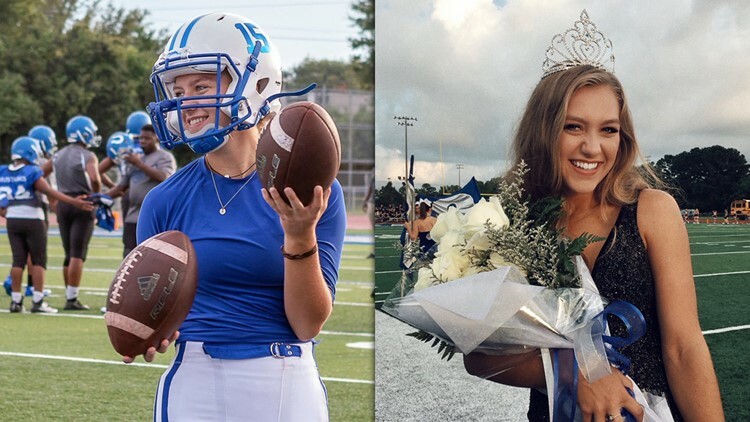 Kaylee Foster in photos taken on the night she was crowned homecoming queen and had a game-winning kick. Crowned the homecoming queen earlier in the night, Mississippi kicker Kaylee Foster went on to hit the game-winning extra point in overtime. For Kaylee Foster, Friday night got off to a dream start. The Mississippi high school student was crowned homecoming queen. Cool, right? Once-in-a-lifetime stuff. As it turns out, Foster is also the kicker for the Ocean Springs Greyhounds’ football team. And on this night, there ended up being room for two once-in-a-lifetime moments. In overtime, Foster kicked the game-winning extra point, clinching a 13-12 win over George County from Lucedale, Miss. Even before that dramatic boot, Foster was the star of the night. Heading into halftime, Ocean Springs led 3-0, and she had scored the game’s only points to that juncture. Homecoming queen? Check. Lone contributor on the scoreboard? Double check. And as the game progressed into overtime, Foster’s number was called once again. She obliged, kicking the game’s most crucial point and finishing with seven of her team’s 13 on the board. WLOX has up-close footage of the fateful kick that improved the Greyhounds’ record to 2-2. Thanks to the versatility of the homecoming queen, September 7, 2018, is not a date Kaylee Foster or anyone at Ocean Springs High will soon forget.